When Stravinsky Met Nijinsky: Two Artists, Their Ballet, and One Extraordinary Riot by Lauren Stringer. Grades 2-5. Harcourt Children's Books, March 2013. Unpaged. Review copy provided by my local library. Igor Stravinsky was a famous composer. Vaslav Nijinsky was a famous dancer. Both of them longed to create something new, but it didn't happen until they started to work together. Together, both men dreamed of their Russian homeland and they inspired each other to create something the world had never seen. When their ballet, The Rite of Spring, debuted, it caused a riot on the Paris streets. Some people HATED IT and some people LOVED IT. But no matter what anyone thought, it certainly changed the world of music and dance forever. This is my favorite kind of nonfiction book: one that takes an interesting story I knew nothing about and brings it to life. This would be an excellent introduction for any students studying ballet or music, especially kids going to see a performance of The Rite of Spring. But it definitely has value outside of fine arts classes, as well. This is a perfect example of collaboration and innovation. If you're doing STEAM programs, remember that the A stands for Art and encouraging creativity. The text is deceptively simple, illustrating a larger concept. I think this is one you could use with a wide range of ages, depending on what you want the kids to get out of it. This book begs to be read aloud. 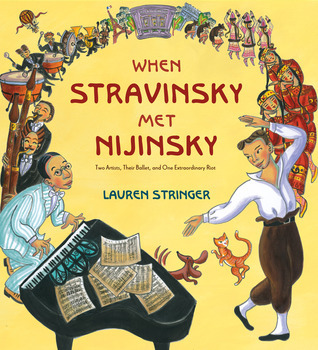 The words are chosen very carefully so that the text reads like a dance or like a concerto.Stringer nails the descriptive passages about Stravinsky's music and Nijinsky's dancing and how both start to change once they collaborate. The text sometimes almost rhymes, it sometimes has a chorus, and lines sometimes have a very strong rhythm. I read it once and then went back to read it again more carefully, deciding that the style fits the story perfectly: not quite rhyming, not quite straight prose, but something new. The illustration support the text nicely, with bright, bold colors and sweeping lines of music. The brushstrokes and color choices show the movement of the dances and I love the spreads showing the audience's reaction to the new ballet - some loving it, some hating it, but everyone feeling feelings. An afterword includes biographical information about both Stravinsky and Ninjinsky, as well as about the ballet The Rite of Spring. Springer writes about her inspiration for writing the book and about some of the paintings from the turn of the century that influenced her art for this book. A list of sources is also included. For more nonfiction picture books celebrating the world of dance, check out Ballet for Martha: Making Appalachian Spring by Jan Greenburg and Sandra Jordan, illustrated by Brian Floca or Dancing to Freedom: The True Story of Mao's Last Dancer by Cunxin Li, illustrated by Anne Spudvilas. For more picture books about the orchestra, check out Zin! Zin! Zin! A Violin by Lloyd Moss, illustrated by Marjorie Priceman or The Remarkable Farkle McBride by John Lithgow, illustrated by C.F. Payne. For older readers interested in reading more about composers or dancers, check out Music Was It: Young Leonard Bernstein by Susan G. Rubin (composer) or A Girl Named Faithful Plum by Richard Bernstein (dancer). When Stravinsky Met Nijinsky is on shelves now! And hey, it's Nonfiction Monday! Head on over to Shelf-employed for this week's roundup.